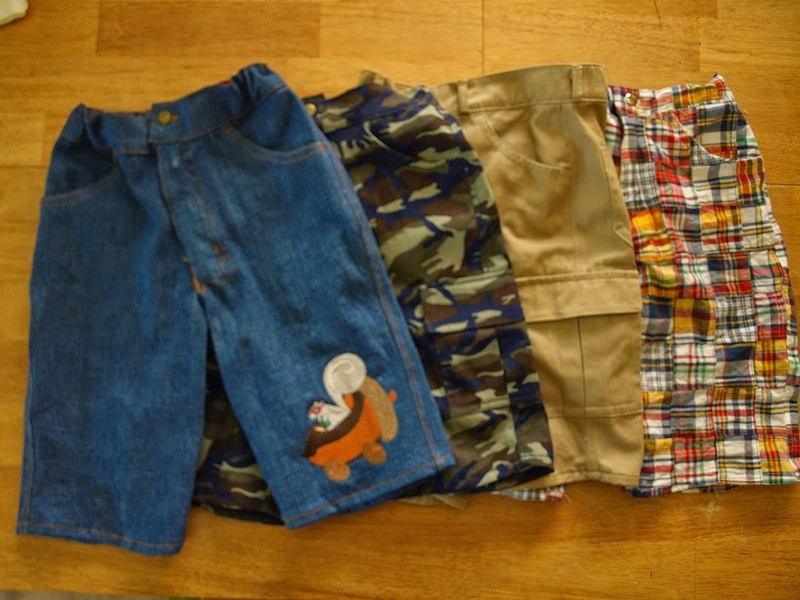 Four shorts I made for youngest son using Jalie 2107. I've been gone for a while, but I am back. The family drama is now a little less dramatic and taking up less of my energy and time. I'm also feeling better. I am also working on a secret project that will be unveiled within the next month or so. It has taken up a lot of time, but oh so worth it. I have quite a few projects to blog about, but will try to do one at a time. Changing the curved pocket to a slant pocket. I finished these two awesome pairs of Jalie 2107 Cargo shorts for my two youngest boys a few weeks ago. This is my favorite shorts and pants pattern for my boys. I think it is my favorite because they ask me to make them. Then, they wear them almost everyday. 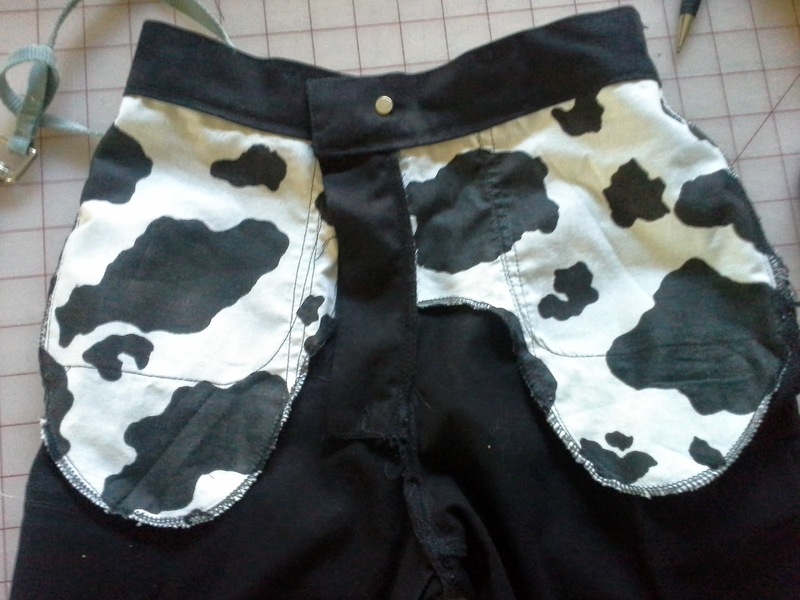 I made my first pair of these as pants for youngest son when he he was in kindergarten. I made him four pairs for school the next August. After that, I just kept making them. 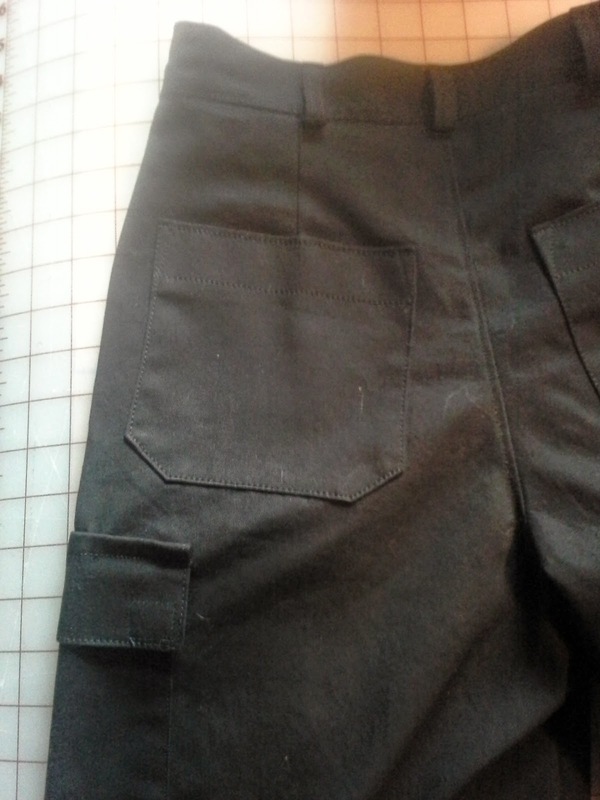 I have made these with and without the cargo pocket, with elastic, with buttonhole elastic, as shorts and as long pants. I have also modified the front pocket. The original pocket is a curved jean pocket. 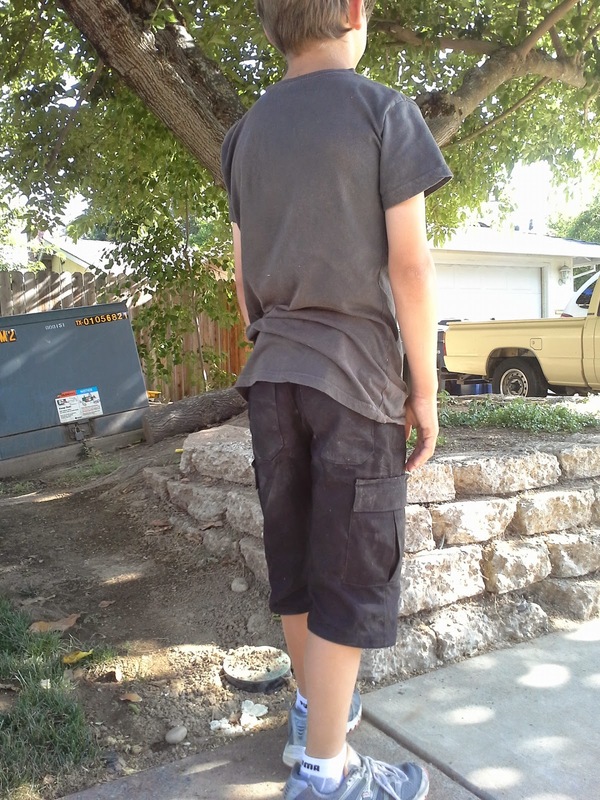 Middle Son prefers a slant pocket. The new cut line for the slant pocket. Since this is a Jalie pattern it has 22 sizes included--size toddler 2 through men's 50. This is definitely a pattern to trace! I have traced mine so much that it is beginning to show signs of wear. When I found out that Jalie was discontinuing the pattern a few years ago, I was more than a little upset. I even emailed them. Jalie now has this and a few of their other discontinued patterns as downloads now! Jalie 2107 is one of these downloadable patterns. They have also now included the pattern instructions separately. They are also on the pattern, but it is a pain to have to open the huge pattern to read the directions. The new markings for slant pocket. I didn't cut the actual pattern pieces. Instead, I folded the pieces. I made some modification on Middle Son's pockets. He prefers a slant pocket to the curved pocket. 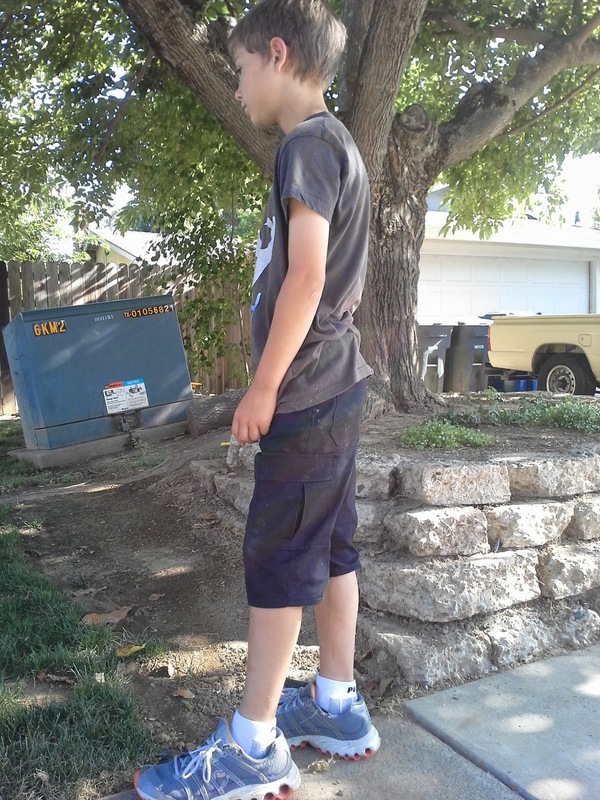 To make this adjustment, I compared his favorite pants and shorts. I attempted to have him try them all on and have him tell me what he liked and disliked about each. Yeah, that didn't go well. Males do not like to try on clothes--and this one also despises discussing the details. Who would have thought?????? 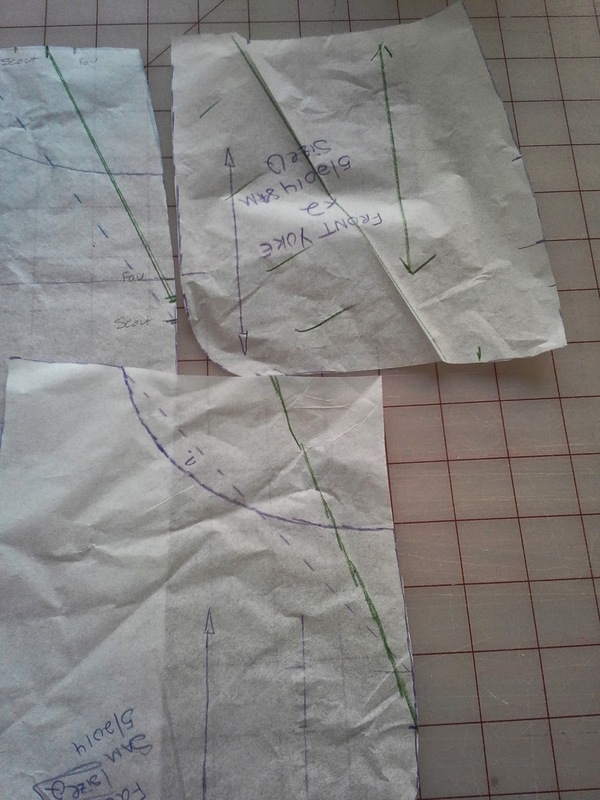 So, to make this modification, you will need to find all the pieces that make up the pocket and front. In this case, there is the front, the pocket facing, and the yoke. 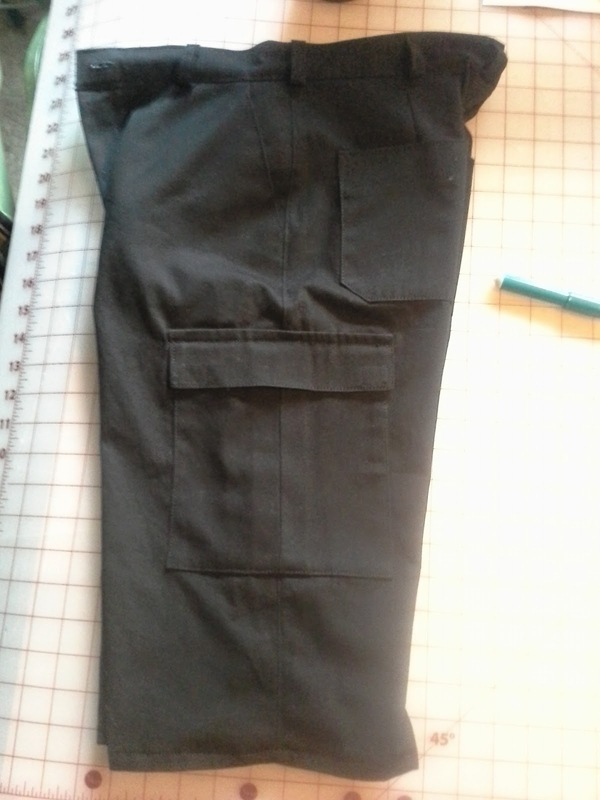 On the picture above, it shows a slashed line that I originally thought would be the cut line, but I managed to sneak in a question about the pants with that slant and he accidentally told me that he preferred a more vertical, slant. Because of this information, I used the longer penciled line along the waist and used the same line on the side. After marking the front, I marked the facing. 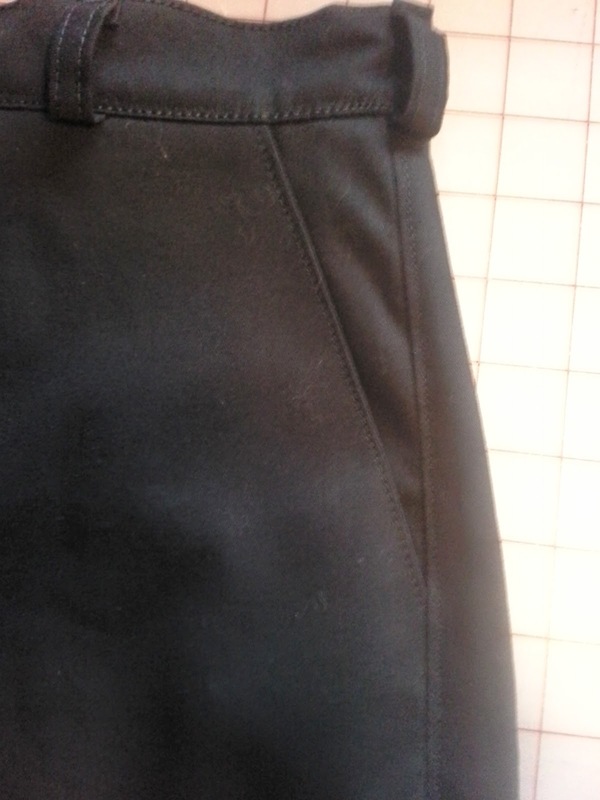 The facing is from the lining in these pants and is part of the pocket. 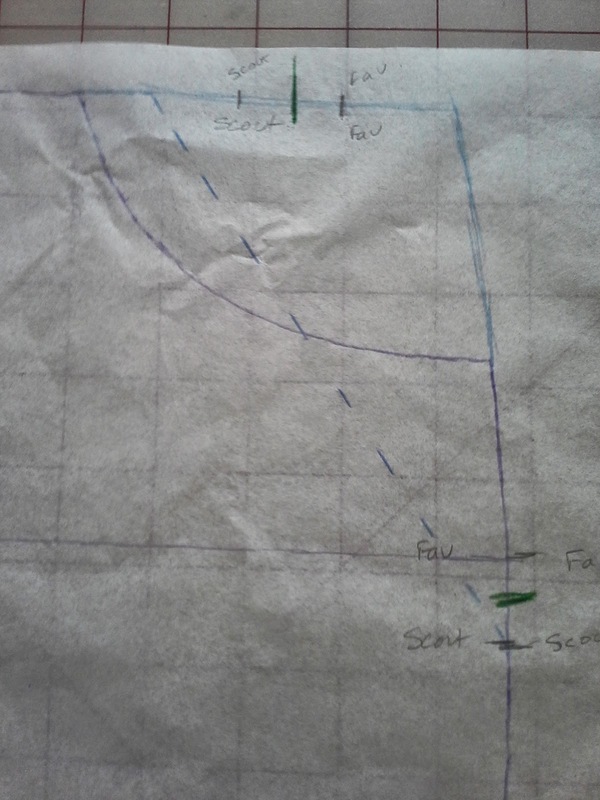 I lined up the marks from the pattern on the front and traced the same new cut line along the pocket edge. Youngest Son like the patterned pockets. On the front yoke, which is from the fashion fabric, I used the original pattern piece and then lined it up with the new front using the pattern markings. I made sure that the new yoke extended past the new pocket edge enough to extend past the edge once sewn and another inch or so. I was now able to continue the assembly by following the directions. Yes. I follow the directions on these pants. These are GREAT instructions. The only modifications I make are that I serge the seams, then top stitch. 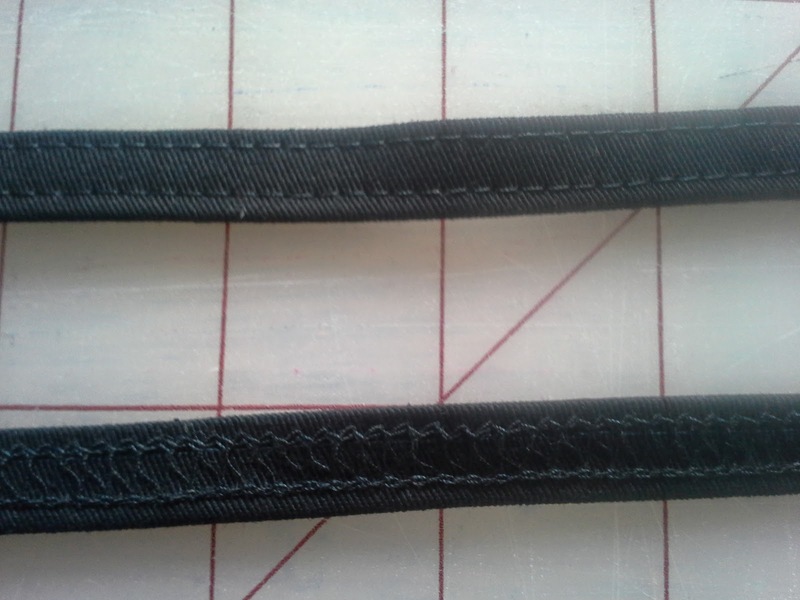 I also use top stitching thread in the middle and regular, all purpose thread in the bottom. When I use top stitching thread, I only use it in the top needle and only when top stitching. I also use a #18 Jeans needle. This keeps the tension right on my machine. 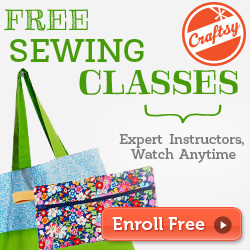 If you have a needle threader on your machine, don't use it with the top stitching thread. It has bent my threader in the past. To fix the threader is a service trip. Also, it has jammed my auto cutter, but that is an easier fix. I don't have too many pictures of these on the boys. Middle Son decided he wasn't going to stick around for photos. Youngest son immediately found dirt and got comfortable. I can tell you that in the month since these were completed, they have been worn almost every day. They have become their favorite shorts and there is a request for more. I have also been considering doing a sew along for these pants/shorts. If I were to do a sew along, I would cover many details and variations. Since this is a pattern for men and for boys, this may be your chance to sew for guy with some guidance. Would you be interested in participating in a sew along for Jalie 2107? I won't participate, but will follow along. Your work on these shorts is impeccable!!! I can see why your sons would rather have you sew for them. Thanks Vanessa. I think that sewing for my boys is what improved my sewing the most. 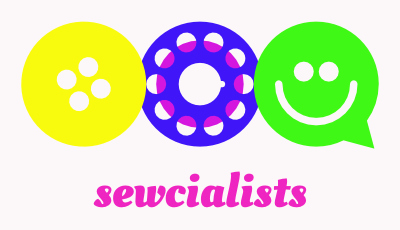 Since most stitching is hidden or camouflaged in girls clothes, I clould be less meticulous. With boy's clothes, the stitching is what sets the difference between being made at home and looking homemade. I've actually spent more time inspecting the details of men's clothes while doing laundry or shopping. The worst is when looking at the detials of back pockets when we are out in public. I hope I'm not obvious. Wow, I can't even believe you made these! You did an amazing job. It is such a great pattern, no wonder you've made it so many times. Thank you. Sewing for guys has shown me how versatile a basic pattern can be. The most important part is the fit. This pattern is a great fit for my guys. These are fantastic! Great job!! I am always on the lookout for a pattern for boys. Although I have to admit, I scared to tackle a fly front pant/short. Annie, this is a great pattern for boys. It is very versatile. I understand the fly always makes me a little apprehensive each time I make them, but I only messed up once. It was super heavy denim that is not for pants. 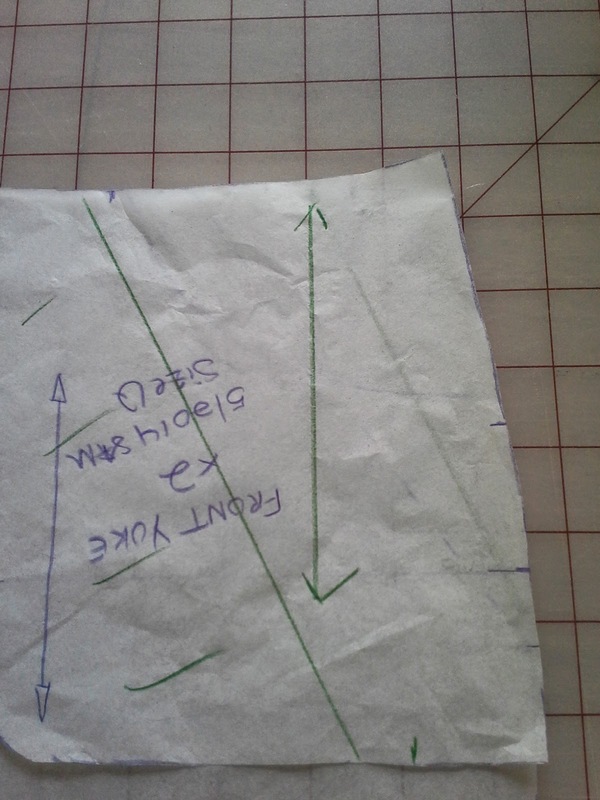 I am trying to plan a sew along that would break down the steps of the fly in pictures. Maybe even video...maybe.